To understand this chart, some context is necessary. The ecological footprint is a metric which measures how much nature we have (Biocapacity) and how much nature we use (Ecological Footprint Consumption). Biocapacity represents the productivity of ecological assets (e.g. cropland, grazing land, forest land). These areas can absorb most of the waste humans create – especially carbon emissions. Ecological Footprint Consumption measures how many natural resources a population consumes in a given area. It is way too crowded. The labels for the respective countries are not clearly visible and it is difficult to pick out a specific country in which you might be interested in. It is not clear by which measure the viz is sorted by. It seems like it is sorted by the highest value of carbon emissions, but it is not clear why exactly it is this category and not one of the other categories. Small values in the stacked bar chart are hardly visible. Countries with low emission values are almost impossible to decipher. I created an exploratory viz which shows the percentage of total consumption for all ecological assets categories. The viz shows clearly the largest category of ecological consumption for each country. The donuts where a logical choice to combine the 2 most important information I wanted to display: The name of the country and the percentage of Total of ecological consumption for each country. By using the donut chart I was able to display the abbreviation for each country inside each donut and avoid the overlapping country labels on the x-axis of the original viz. The percentage of total donuts also have the advantage that small values are not overlooked inside a stacked bar chart like it is the case in the original viz. It is possible to highlight each category by clicking on it on the legend. By doing this, the audience can very easily find out which category is the most consumed for each country. I added an additional filter which filters on the 9 countries with the highest/lowest overall consumption for each category. The is some clutter. The gridlines could be removed, the date label is not necessary since the years already indicate that the x-axis is populated with date values. The choice for an area chart is questionable. Area charts are usually the most useful when leveraging it as a stacked up area chart which indicates a part-to-whole relationship. More detailed information about this can be found in the following blog-post: https://www.fusioncharts.com/blog/line-charts-vs-area-charts/ Since this is not the case here, a line chart would have worked just as well and would create a cleaner look. I do not like the choice of color. Yellow and orange could be mistaken for a continuous color palette for a continuous variable. Since the dimension Reporting Category is a discrete variable I would avoid possible confusion by choosing two colors which can clearly be distinguished from each other. A possible choice could be yellow and blue. The viz does not tell a story. It is not explained why the distinction between Health Facility Worker and Community Health workers is important and which conclusion we can draw from that distinction. The trend seems to be an overall decrease of malaria cases in both categories but also this trend is not revisited in the title. The data set provided additional fields to the ones used in the original viz. These additional fields included province name and area( urban or rural). I used this additional fields to show the high difference in malaria cases between rural and urban areas and to create a map which shows the southern provinces of Zambia. Malaria is on the retreat since the year of 2014. In both, rural and urban, areas. This trend is also applicable to almost all states of the data sets. 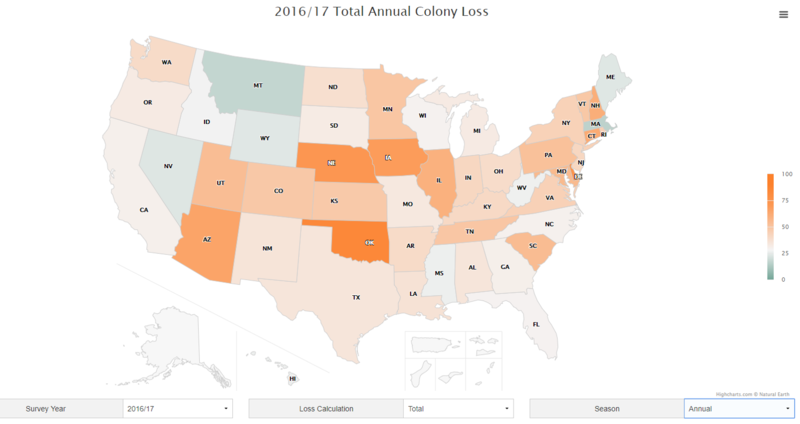 I included a map which is color-coded by the number of malaria cases between the year 2014-2017. The map also provides additional context to the topic of the viz and draws the attention of the user since it is interactive. To illustrate the trend of decreasing malaria cases over time I aligned bubbles, coded by size, on a horizontal line. 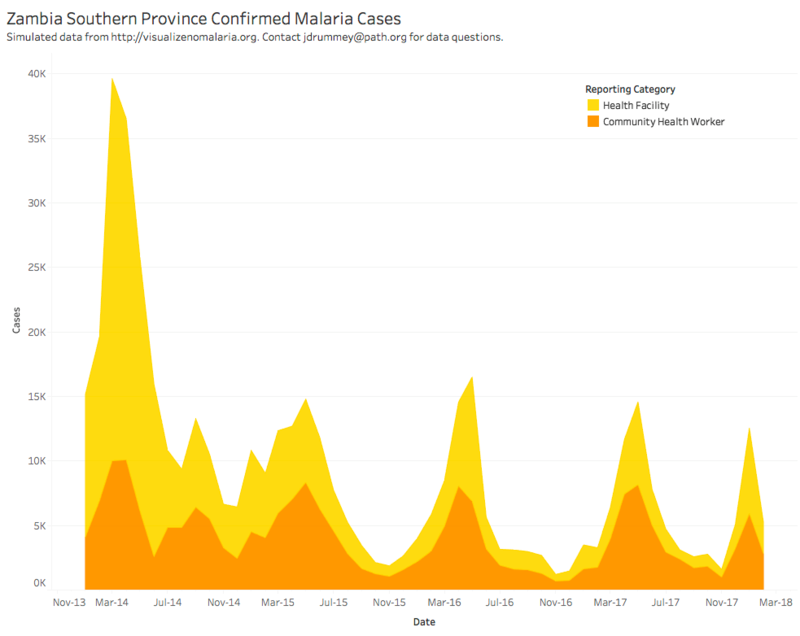 The shrinking bubbles highlight the decrease of malaria cases in each province or overall. The horizontal line indicates the development over time. The rows are split up by the area field. This facilitates comparisons between rural and urban areas. The legend is too long! Every year has its entry in the legend. Since the years cannot be distinguished by color anyway (most of them are grey), listing them is counterproductive. Different statistic measures like Median, average and interquartile Range and standard deviations are all part of the chart but are really hard to distinguish by color. They only vary in shades of grey (no pun intended). There is some clutter. The gridlines could be removed. The title “date” for the x-axis is not necessary since the name of the month already implies that this axis shows dates. The 1. day for each month can be removed. It is not really clear why December appears twice. The creation of two data points with only one day in between (31.12 and 1.1) seems pointless since the data will only show minimal change between these dates. I like the highlighting for 2012 in green color. 2012 seems to be the year with the lowest Arctic ice extent so far – therefore the highlighting. I also like the salient orange color for the most recent year of 2018. This emphasizes that the most current year is likely to supersede the year 2012 as the year with the lowest Arctic ice extent. I want to show the decrease of sea extent over time. To achieve this, I chose a title which already frames the narrative of the viz (Ice turning into water). The subtitle then names the exact number of decrease in Million SQ KM (1.95). The number is then again picked up in the viz. The box around the number spans over all bars (each bar resembles a year) of the first visualization, indicating that the number refers to the development over all years. The second message I want to convey is the cycle of decrease and increase of the ice extent within each year. I used a second chart type, a line chart, to show this development. The color choice was the most difficult one. On first thought, blue is often associated with cold and following the logic, red is associated with increasing temperature. But in the case of this viz it did not really work for me. First of all, ice is white and not blue and second, the temperatures are still very low – even though they are rising. Therefore associating low temperature with a red color which generates pictures of high heat in our head felt counterintuitive. In the end, I decided to create a continuous color palette from white to dark blue. White for the ice and blue for water from the melted ice. Since this color choice might at a first look unusual (blue often being associated with cold) I felt that I need to explain the colors in the title as well. Therefore, the color-coded title. Ice turning into water. To show the melting of the ice I opted for a bar chart colored by a continuous color palette from white to dark blue. This creates the imagery of melting ice. Over the years the columns transcend from a deep white into first a lighter blue and then a darker blue. The bar chart is split into multiple columns, one for each year. By hovering over the respective columns in the bar chart, the tooltips show the ice Arctic extent for the selected year. The line chart in the lower half of the viz shows the decrease and increase of the Arctic sea ice within a year. I found it interesting that the ice extent fluctuates by a big margin within a year. 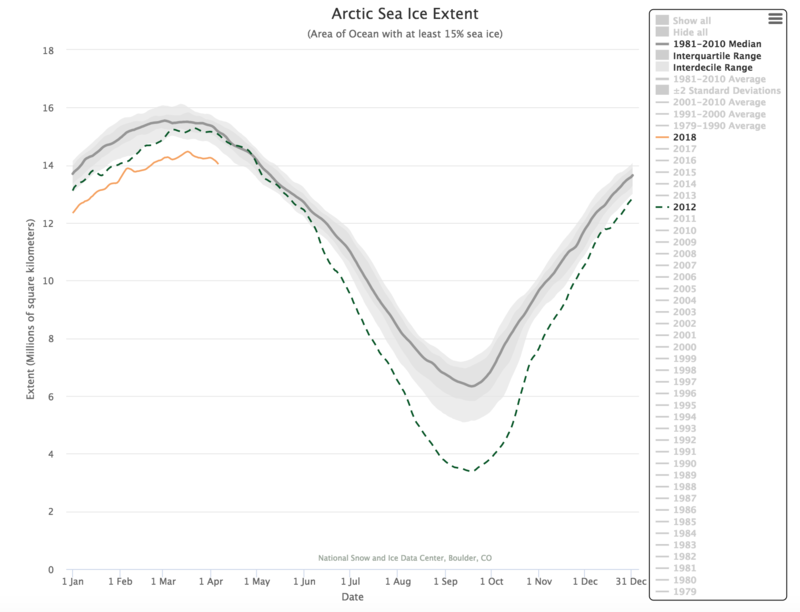 The annotation calls out the peak (March) and the bottom (September) for the Arctic sea ice extent. The two visualizations interact with each other. Clicking on a year in the upper bar chart will highlight the corresponding year in lower line chart and vice versa. There are too many labels. The y-axis already shows the scale for the line so there is no need for data labels for each year. Labels at the start and at the end of the line would be sufficient. The title does not call out a finding. The audience is expected to interpret the viz itself. The colors in viz do not distinguish between forecast and actual figures. The viz looks dull. There is really nothing which would catch the attention of the audience. No picture, no interesting color choices, no highlighter, no use of preattentive attributes. The viz is supposed to give an overview over all producing wine countries in the dataset. So I decided to not call out single findings already in the title, but let the audience draw the information from the viz which they need. This can be done by selecting a country in the highlight box or by hovering over the respective line of the Sankey chart. 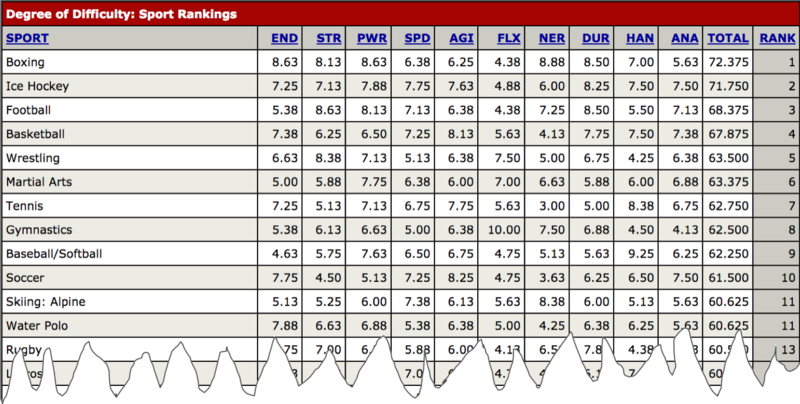 However, I did decide to call out the biggest wine producers (TOP 3) in a separate table on the lower left. The lines are double coded by color and size. Higher production output of wine in mhl (million hectoliters) is illustrated by a darker red / thicker lines. Clicking on a line will update the production output in mhl on the wine cork on the upper left for the selected country. I had some private issues to take care of, so my MakeOverMonday posts are a bit delayed and incomplete. I did participate in the challenge every week but unfortunately did not find the time to write a blog post about each visualization. I will not catch up on every visualization I created but pick a few which I thought were interesting. The viz looks dull. There is nothing which catches my eye. The colors are boring and there is nothing which would pick up the whiskey topic, like a picture or a green color palette which would remind the audience of Irish whiskey. There is some clutter. The gridlines are not necessary and could be removed since they might interfere with the actual lines from the line chart. The labels are incorrect. The 50 label misses the percentage sign. Also, the date labels vary in space between each other. The title is much too small. It does not jump into the audience’s eye immediately. Also, it does not convey a finding from the data. The dataset actually contained more information than depicted in the original viz. It also included information by country and about the whiskey category (standard, premium, super premium). 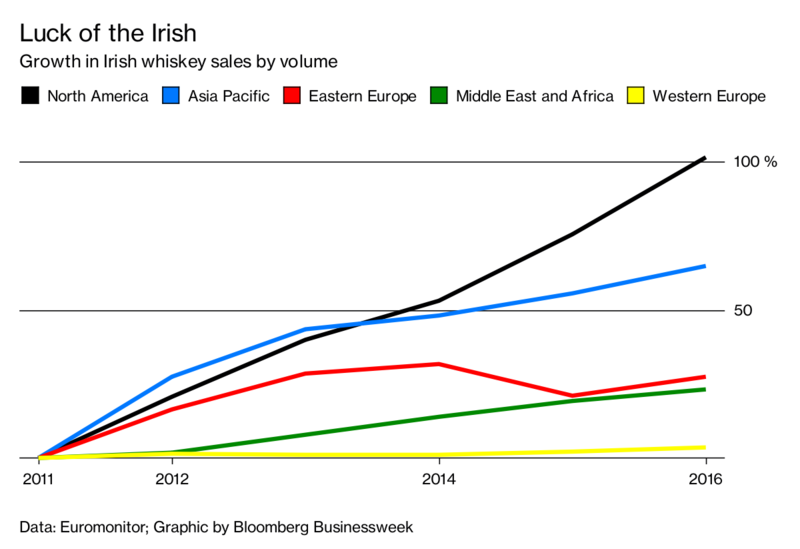 When looking at the data, one development struck me the most: Germany had by far the biggest increase in sales of Irish Whiskey in the super premium category. Therefore, I decided to create a viz which focuses on this discovery. I went with a small multiples chart which shows the development in sales over time for each country with a combination of a stacked area chart and a line chart. Germany is highlighted in green/turquoise to show it is an outlier while the other countries are colored equally in grey. The countries are sorted left to right in decreasing order by sales growth. The title specifically calls out Germany as the country with the biggest increase. A legend on the upper right depicts the time frame of the data. Nils' Data Playground Create a free website or blog at WordPress.com.